Can't attend? Follow LAUGH MALAYSIA TOUR to know of future events! 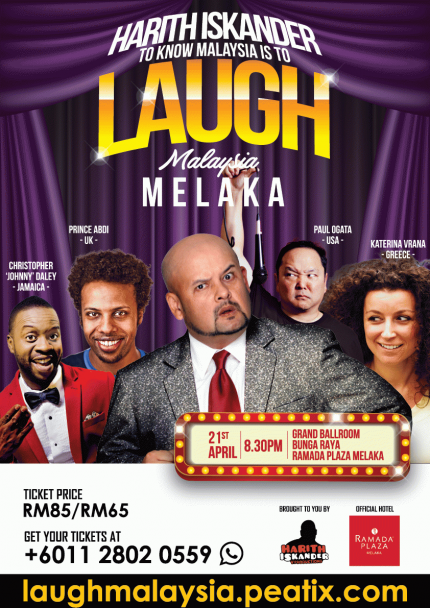 Harith Iskander's To Know Malaysia, Is To Laugh Malaysia brings together 5 of the biggest stars of international comedy for a spectacular and hilarious tour of comedy to three Malaysian states. This Leg brings them to Melaka! While the comedians savour the sights, sounds and food in these iconic cities in Malaysia, they aim to find out “what so funny about Malaysia?”, they also share with you, what is funny in their world in this very special showcase. Note: Free Seating for VIP/Standard.